The Medicaid program. It is the largest item in every state budget. Decisions made regarding its administration can literally have life or death consequences for citizens. And enrollments and program demands are growing. Complex policy and political choices regarding Medicaid may get a lot of press, but Medicaid’s management challenges may well be more important. To explain the significance of these challenges, the Milbank Memorial Fund turned to a former governor and former director of a state health and human services agency—and asked them to draw on their own experience to help the nation’s governors understand why focusing on Medicaid management is so important. In this issue brief, John Kitzhaber, MD, former three-term governor of Oregon, and Bruce Goldberg, MD, who served two Oregon governors as the director of the Office for Oregon Health Policy and Research, outline why strong Medicaid management matters and the key attributes needed for that management. 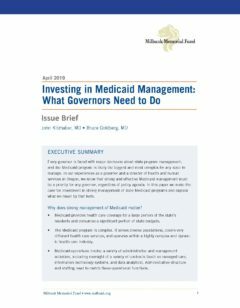 Speaking directly to governors, the authors spell out why greater state investment in Medicaid administration is critical to attracting and retaining the talent needed to ensure that the program is flexible and innovative, fiscally responsible, and stable.